Amber from Poland. Amber jewellery. Arkada Art - exclusive silver and amber jewelry. The best quality amber jewellery from Poland. 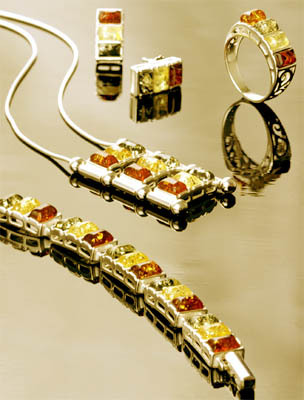 Silver and amber jewellery. Modern amber jewellery. Natural Baltic amber jewellery. The minimum quantity is 5 pcs per item and 3 pcs for items over 10 g. The minimum value of the order is 1500 EUR. We have not value requirement in case first order. We give 5% discount if the order is over 8 000 EUR. Payments by advance T/T to our bank account as soon as we inform the readiness of the shipment. If we receive confirmation of the payment we send the parcel with our goods. 3 - 6 weeks after receiving order. We send our articles in parcels via DHL or UPS. We enclose certificate of origin. We do not cover the cost of the delivery and insurance. Misplace and damage goods are returnable. 7. If you are EU company and are not registered for VAT we will add 23% VAT to our prices. Arkada Art - the manufacturer of exclusive silver and amber jewelry. The best quality amber jewellery from Poland. Handcrafts silver and amber jewellery. Modern amber jewellery. Unique natural Baltic amber jewellery. Wholesale.